Different states have different rules and regulations. Your Contract for Deed/Land Contract will be customized for Virginia. What is a Contract for Deed?It is a contract for the purchase of real property (real estate) in which the seller retains the deed (title) to the property until the buyer makes payments in installments equal to the agreed upon purchase price. The purchaser has an immediate right to possession of the property, but the seller defers delivery of the deed (transfer of title) until they have secured all or part of the purchase price. A Contract for Deed is useful when a buyer is unable to obtain financing other than seller financing. The purchase price (the "Purchase Price") of the Premises is $__________. The Purchaser agrees to pay $__________ upon execution of this Agreement and the balance of the Purchase Price being payable in monthly installments of $__________, due on the __________ of each month, beginning on April 19, 2019 until the Purchase Price is paid in full. Interest of __________% per year will be computed monthly and deducted from the monthly payments. The balance of the monthly payment will be applied to the principal amount of the Purchase Price outstanding. For the duration of this Agreement, the Purchaser will be responsible for all taxes, and assessments levied against the Premises. The Purchaser is responsible for insuring the Seller's contents and furnishings in or about the Premises against both damage and loss and the Purchaser assumes liability for any such damage or loss. The Purchaser is hereby advised and understands that the personal property of the Purchaser is insured by the Seller for both damage and loss, and the Seller assumes responsibility for any such damage or loss. Any premiums paid by the Seller for the Purchaser's contents insurance are payable to the Seller by the Purchaser within 30 days of the Seller furnishing receipts evidencing such insurance to the Purchaser. The Purchaser is hereby advised and understands that the Premises is insured by the Seller for both damage and loss to the structure, mechanical or improvements to the Premises, and the Seller assumes responsibility for any such damage or loss. Any premiums paid by the Seller for the insurance on the Premises are payable to the Seller by the Purchaser within 30 days of the Seller furnishing receipts evidencing such insurance to the Purchaser. The Seller will maintain liability insurance on the Premises, and the Seller assumes responsibility for any such damage or loss resulting from the liability of the Purchaser or the Seller. Any premiums paid by the Seller for the insurance on the Premises are payable to the Seller by the Purchaser within 30 days of the Seller furnishing receipts evidencing such insurance to the Purchaser. For any required insurance of the Purchaser stipulated in this contract, the proof of insurance will be furnished to the Seller upon renewal of such insurance within two weeks of renewal. In the event of the Purchaser's failure to perform any covenant or condition contained in this Agreement, the Seller will give the Purchaser a notice of default. The notice will give the Purchaser 14 days from the date the notice is received to remedy the default. If the Purchaser fails to remedy the default within 14 days, then the entire balance of the Purchase Price, including interest payable, will become due immediately after the fourteen (14) day period to remedy the default expires (the "Notice Period"). Failure to pay the full amount of the Purchase Price owing will result in the termination of this Agreement at the end of the Notice Period. The Purchaser and the Seller agree that in the event that the Purchaser fails to remedy a default and this Agreement is terminated, the Purchaser will vacate the Premises within __________ days of the Agreement terminating. The Purchaser and the Seller further agree that failure of the Purchaser to vacate within that period gives the Seller a right to maintain an action to obtain vacant possession of the Premises. In the event of default and termination of this Agreement by the Purchaser, the Purchaser forfeits any and all payments made under the terms of this Agreement, including but not limited to all payments made towards the Purchase Price, and any and all taxes, assessments, or insurance premiums paid by the Purchaser, as liquidated damages for breach of this Agreement. The Seller reserves the right to recover damages resulting from the willful acts or negligence of the Purchaser. (iii) pay all expenses incurred by the Seller in enforcing their rights under this Agreement. All payments made under the preceding provision must be made in a form acceptable to both parties. The Purchaser may not sell, assign, transfer, convey, encumber, or otherwise deal with any interest in the Premises without the written consent of the Seller. Upon payment of the full Purchase Price, including all taxes, assessments, interest, and other charges due to the Seller, the Seller agrees to deliver to the Purchaser, within a reasonable amount of time, a Warranty Deed to the Premises in the name of the Purchaser, free and clear of all liens and encumbrances. The Purchaser and the Seller shall make all disclosures required by law. In the event the Purchaser pays a monthly installment payment after it becomes due, there will be a late fee of $__________ assessed to the Purchaser as a reasonable pre-estimate of the Seller's loss as a result of the late payment. Such fees will be deducted from any payment to the Seller before being applied against the monthly installment owing. The Seller reserves the right to encumber the Premises with a mortgage. The Seller agrees to meet the obligations due under the mortgage and to provide proof of the same to the Purchaser upon the written demand of the Purchaser. The Seller reserves the right to convey their interest in the Premises, subject to this Agreement. Such conveyance will not be cause for termination of this Agreement. This Agreement will act as security for the performance of all of the Purchaser's obligations under this Agreement. Time is of the essence for the performance of all of the Purchaser's obligations under this Agreement. In the event of a default by the Purchaser, the Purchaser will pay all the Seller's reasonable and actual attorney fees associated with enforcing the Seller's rights under this Agreement. The default will not be deemed to be corrected until all attorney fees have been paid. This Agreement will constitute the entire agreement between the Purchaser and the Seller. Any prior understanding or representation of any kind preceding the date of this Agreement will not be binding on either party except to the extent that it is incorporated into this Agreement. Any amendments or modifications of this Agreement or additional obligations assumed by either party in connection with this Agreement will only be binding if they are evidenced in writing and signed by each party or an authorized representative of each party. A waiver of any rights by any party in connection with this Agreement will only be binding if evidenced in writing and signed by each party or an authorized representative of each party. If there is a conflict between any provision of this Agreement and the applicable legislation of the Commonwealth of Virginia (the "Act"), the Act will prevail and such provisions of this Agreement will be amended or deleted as necessary in order to comply with the Act. Further, any provisions that are required by the Act are incorporated into this Agreement. In the event that any of the provisions of this Agreement will be held to be invalid or unenforceable in whole or in part, those provisions, to the extent enforceable and all other provisions of this Agreement will nevertheless continue to be valid and enforceable as though the invalid or unenforceable parts had not been included in this Agreement and the remaining provisions had been executed by both parties subsequent to the expungement of the invalid provision. All Sellers are jointly and severally liable for the acts, omissions, and liabilities of all other Sellers to this Agreement. This Agreement will extend to and be binding upon and inure to the benefit of the respective heirs, executors, administrators, successors, and assigns, as the case may be, of each party to this Agreement. All covenants are to be construed as conditions of this Agreement. IN WITNESS WHEREOF the Seller and Purchaser have duly affixed their signatures under hand and seal on this ________ day of ________________, ________. The foregoing instrument was acknowledged before me this ________ day of ________________, ________, by _________________________. What is a Contract for Deed? A Contract for Deed is a document used for the purchase of real property (real estate) in which the seller retains the deed (title) to the property until the purchaser makes payments in installments equal to the agreed upon purchase price. The purchaser has an immediate right to possession of the property, but the seller defers delivery of the deed (transfer of title) until he or she has secured all or part of the purchase price. The land contract is generally used when a buyer is unable to obtain financing through traditional methods and instead makes monthly payments to the seller, a process known as owner financing or seller financing. 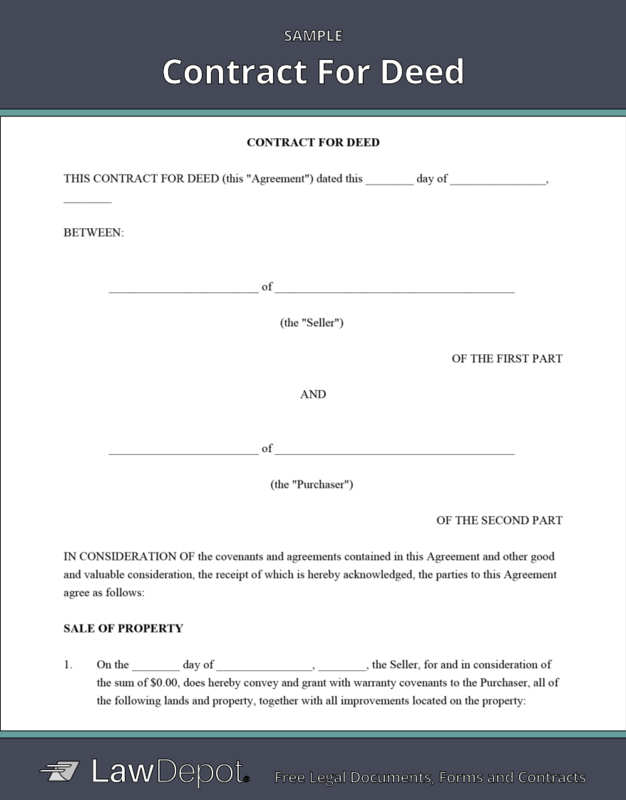 How do you write a Contract for Deed? When should you use a Contract for Deed? If the seller is providing financing in a real estate purchase, you should use a Contract for Deed. Generally, the purchaser will be repaying the loan to the seller through monthly installments. A Contract for Deed is commonly used when a buyer is unable to obtain financing from a traditional lender due to poor credit rating, insufficient collateral or down payment, changed employment situation, sporadic employment history, or a high personal debt to income ratio. How do I determine payments? The monthly payment required on a Contract for Deed is usually similar to that of a mortgage payment, meaning that a portion of the installment will go towards the repayment of the principal, and the other portion will go towards the repayment of the interest owed. One way to determine a fair interest rate and to calculate the payments is to contact local financial institutions or mortgage brokers to find out current industry standard rates that are charged by lenders. What is a purchase default on a Land Contract? If the purchaser is late in making a payment, the purchaser has a notice period to remedy the default. During this period, he or she will be subject to a late fee, the amount of which is decided in the agreement. When the purchaser fails to remedy a default, he or she will only have a limited time to pay off the remaining balance of the purchase price. He or she will also be required to vacate the property within the timeframe agreed upon in the contract. The seller has a right to reinstate this agreement if the purchaser can cure the defaults that have occurred. However, this right is at the sole discretion of the seller. Because of this, it is important the parties agree to feasible repayment terms so the purchaser will be less likely to default under this agreement. What are the responsibilities in a Contract for Deed? In a Contract for Deed, both the seller and the buyer have responsibilities when it comes to the property. Unlike a lender-financed mortgage, the seller retains the property deed until the purchase price has been paid in full. Because of this, each party has different obligations in terms of insurance and property tax. In most cases, the seller will be responsible for insurance on all of his or her personal items that remain on the property prior to the buyer receiving the deed. The purchaser will be responsible for insurance for his or her personal items, the property itself, as well as liability insurance. Usually, the purchaser takes over property tax payments from the seller. 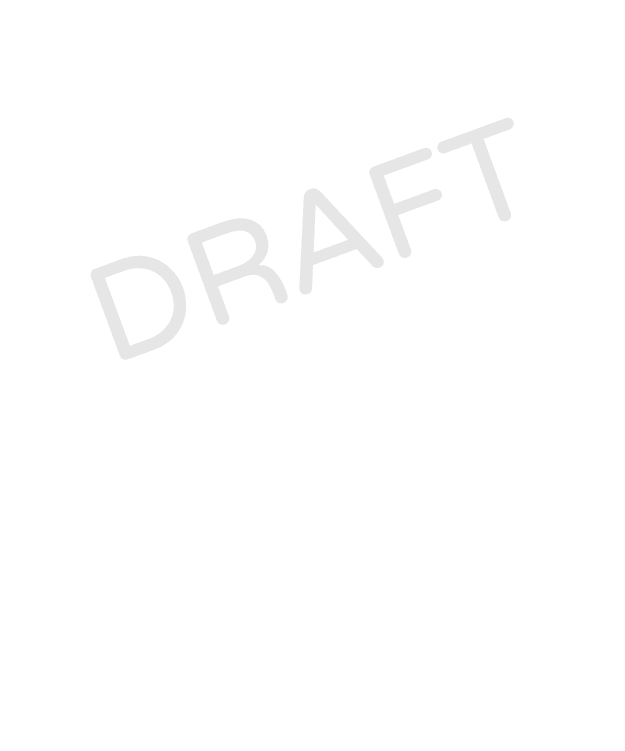 Personalize your Contract for Deed template.